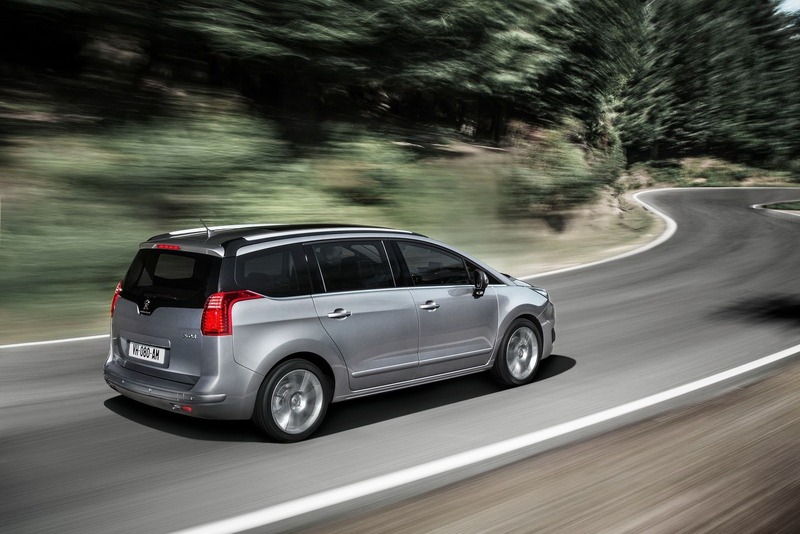 quanto ti piace la Peugeot 5008 Facelift 2013? 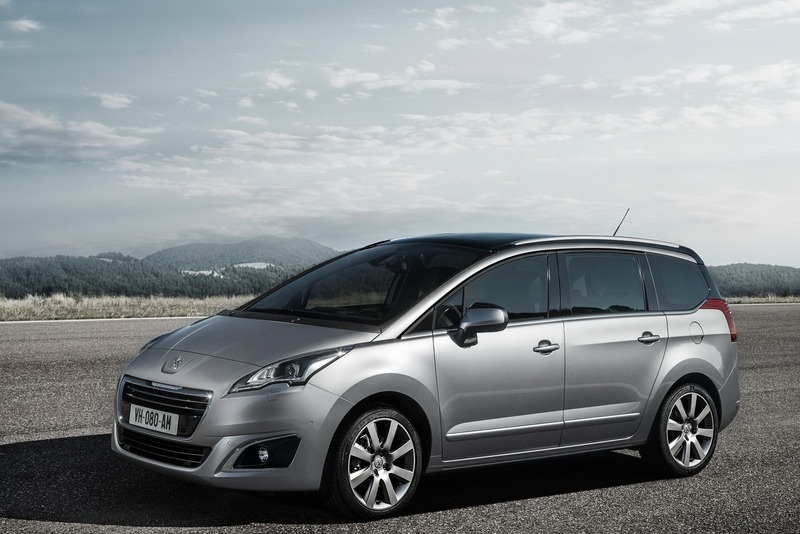 1. quanto ti piace la Peugeot 5008 Facelift 2013? When the 5008 arrived in the segment, Peugeot shook up the range of products available with a vehicle which, while observing the essentials expected, brought previously unheard-of qualities. 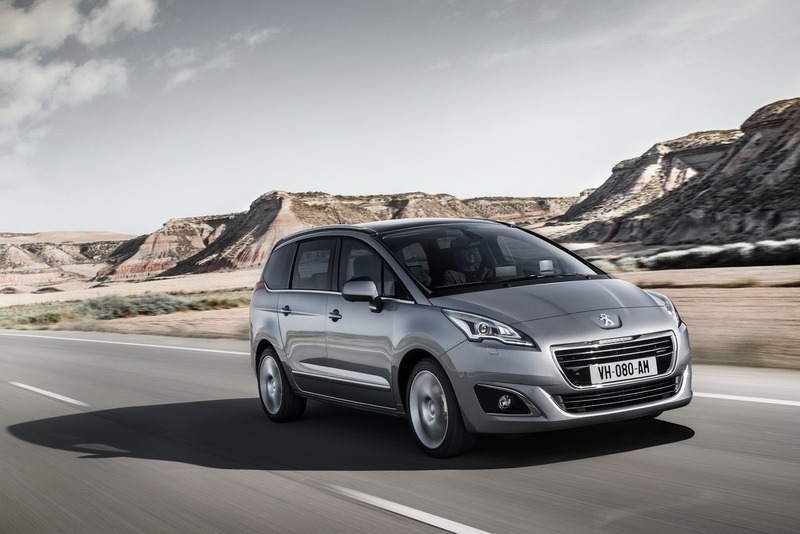 Its fluid and elegant style and its dynamic qualities make it a unique product in the segment.Within a compact size, the Peugeot 5008 carries its passengers in a high level of practicality, comfort and safety. From an elevated position, defined by a high console, the driver has a clear view of all the surroundings. The road speed is also indicated on the Head-up display. 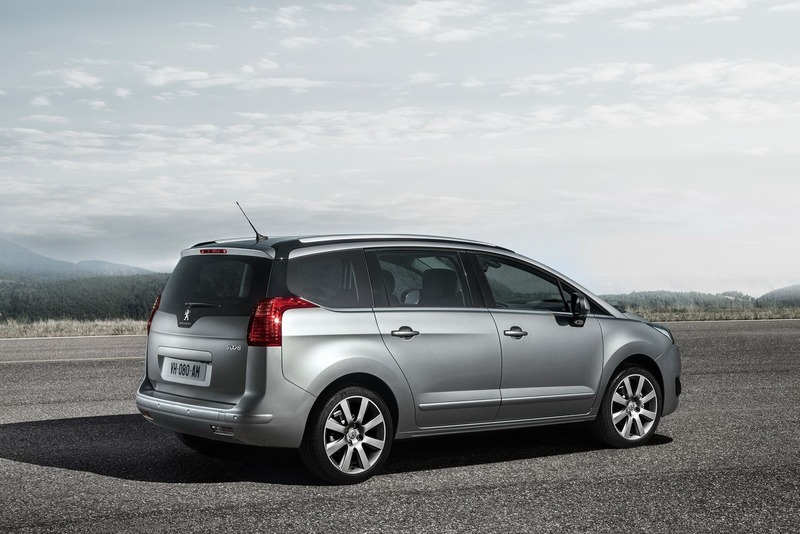 The 5008 is practical to use and stimulating to drive. Functional, the rear compartment allows flexibility in the use of space: five individually retractable seats, flat floor, folding front passenger seat with table position... The seven seat version offers a high level of accommodation for the two additional passengers, in a space in which it is comfortable to travel. 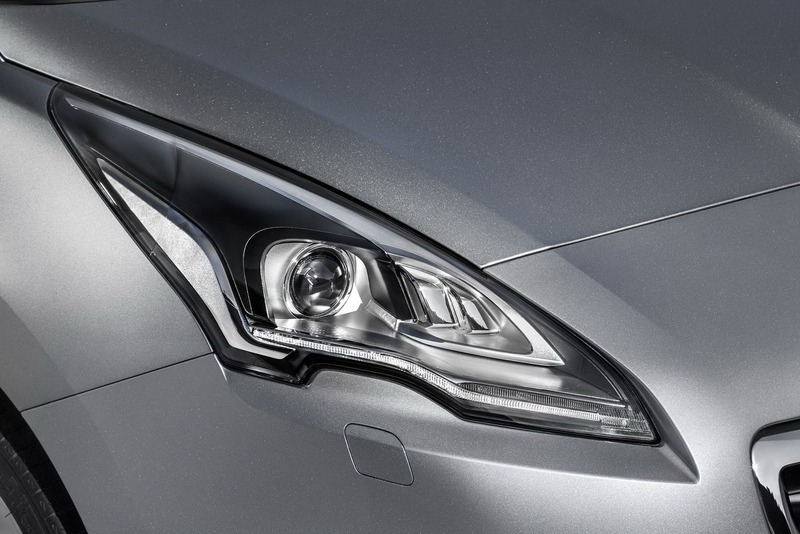 The new 5008 has a top-of-the-range style which is perceived instantly as indicated by the light signature of the new technological headlamps. The completely new front appearance adopts the stylistic codes of the marque, with technological headlamps that express strength through their meticulous integration with the bodywork. Technological, on the top-of-the-range versions have a xenon lens, the projected height of which is corrected automatically according to the load and the beam of which is directed towards the inside of the prescribed turn. At the base of the headlamp are housed the light signature and the directional indicators, these two LED functions using the flat guide technology. On each side of the lower air intake, a chromed trim emphasises the fog lamp with its 'C' shape design. Between the two headlights is the thin 'floating grille' with chromed bead detailing across the width of the passenger compartment and this perception is reinforced by the lower front panel area, which extends further towards the sides of the vehicle. In profile, the balanced lines express several characteristics, combined for the first time. 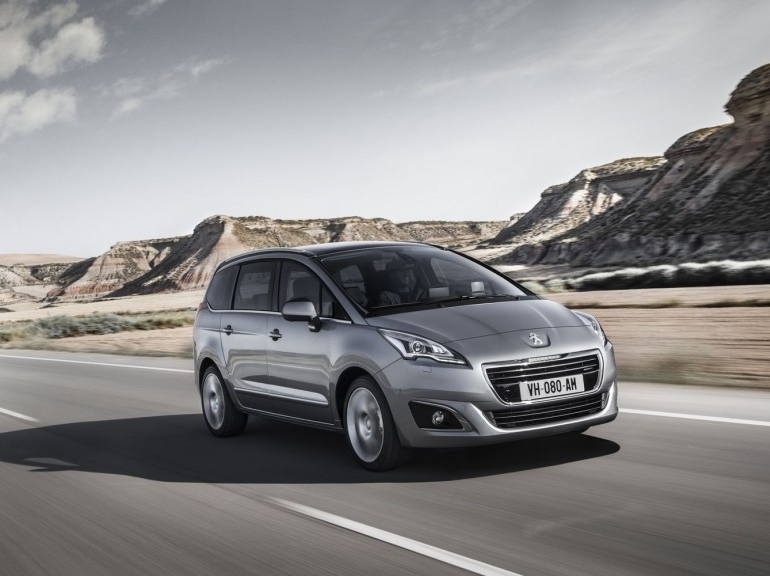 The 5008 has the appearance of always seemingly to be moving due to the pure treatment of the style lines. The plunging bonnet and the windscreen part the air in the most effective and efficient manner. The design is confirmed by the measurements, with a Cd of just 0.29. The body waist line, through its styling directly above the rear wheels, promises a certain dynamism and, through its height, excellent safety. The roof bars have the same function, surrounding the passenger compartment and solidly integrating with the D post. Nevertheless, these qualities are expressed subtly. The glazed surface area is generous from all angles, with the large quarterlight merging uninterrupted into the rear screen. At the rear, the design of the tailgate uncovers a boot which is easy to access, an essential quality in a versatile vehicle. To adorn this innovative interpretation of the Compact MPV, being dynamic and spacious, nine colours are available among which are the new Rich Oak and Artense Grey. The weatherstrips are trimmed in chrome. Among the wheels available, from 16" to 18", is a new 17" diamond Anthra Grey alloy wheel. The doors provide access to a comfortable passenger compartment and to modern instruments and controls, rare in a Compact MPV. The spacious atmosphere on board benefits from the considerable glazed surface area (5.77m²) contributed to by the extensive panoramic roof (2.69m²). On the Allure level, the door sills are covered in aluminium and hallmarked with the marque name. 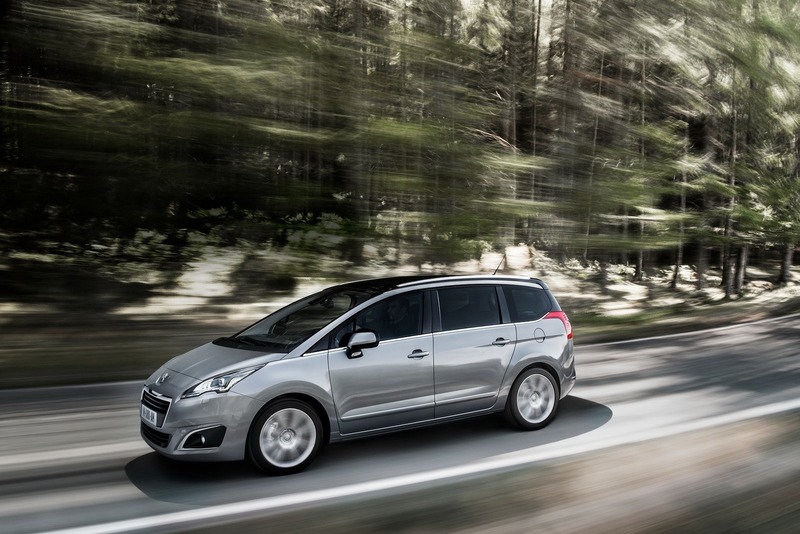 Instinctively, the driver knows that pleasure comes from being at the wheel of the Peugeot 5008. The high driving position and the excellent peripheral visibility make them feel safe and in control. The ergonomics inspired by luxury Hatchbacks, notably through the steering wheel position and the support provided by the seats. In line with the centre of the road is all of the information relating to the operation of the vehicle. The instrument panel with precise graduations has the H e a d-up display positioned directly above it. Without taking your eyes off the road, a single glance at this equipment is all it takes to know the speed of the vehicle and the distance from the vehicle in front, thanks to the Distance Alert. The angle and brightness of the polycarbonate strip are controlled by means of switches arranged within easy reach on the centre console. Close-by, on the dashboard, the screen for the audio-navigation and the trip computer is retractable. Now covered with laser engraving effect, the centre console groups together all of the controls. 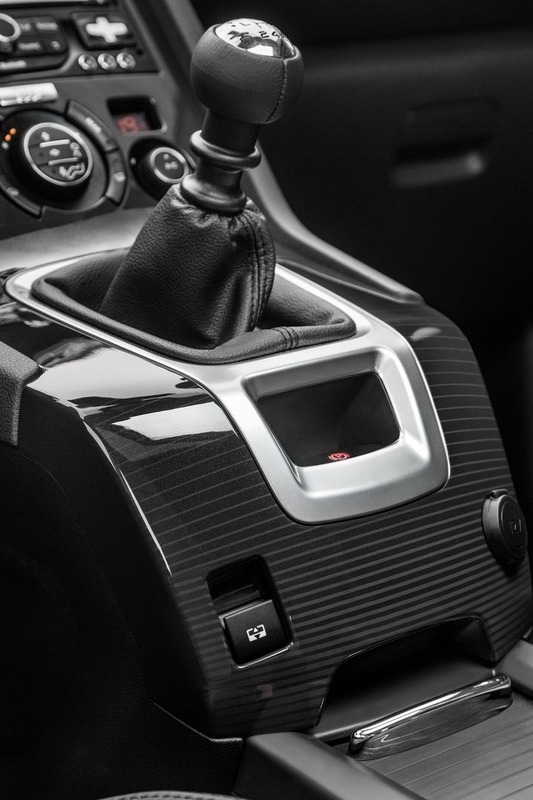 The gear lever and the electric handbrake are easy to handle, and within easy reach. Passengers travel in comfort and safety, with a curtain airbag covering all three rows. With a high level of sound insulation, conversation or audio equipment is easily heard by those in the rear. Irrespective of external conditions, the occupants can choose to be cooled or heated by the air conditioning diffused by the vents on the side pillars. So, all seats benefit from a comfortable temperature. In this large space, 1520mm of room at the elbows, no one is compromised as the seats offer the same quality of accommodation. The three seats in row 2 are of identical width and can be tilted. They also slide over 130mm to alter the legroom, so the travelling position is always comfortable. Access to the two real seats in row 3 is by moving the side seats in row 2. With an easy button movement, the seat cushion rises then the seat back moves forward (cinema seat style), permitting easy access. In addition, the seats of this last row are arranged in a space 1341mm wide at the elbows and staggered in relation to the row in front. The passengers therefore benefit from a clearer view forwards. 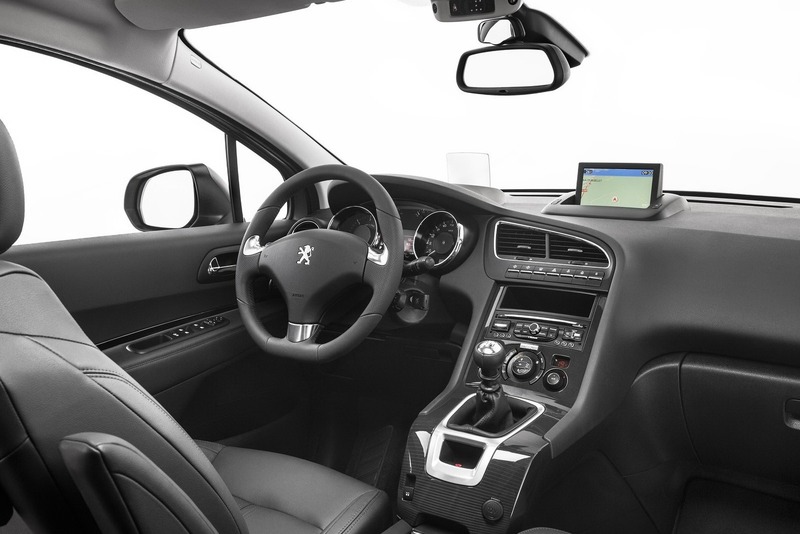 For more enjoyable journeys, the 5008 has the option to be specified with a multimedia system perfectly integrated in the passenger compartment. It consists of two 7" colour screens, installed within the front head restraints, a connection console compatible with any portable audio/video equipment and two Bluetooth® wireless headphones. For the third passenger, additional headphones can be connected. This multimedia system is flexible and can play different sources on the two screens, allowing the passengers to choose different activities. 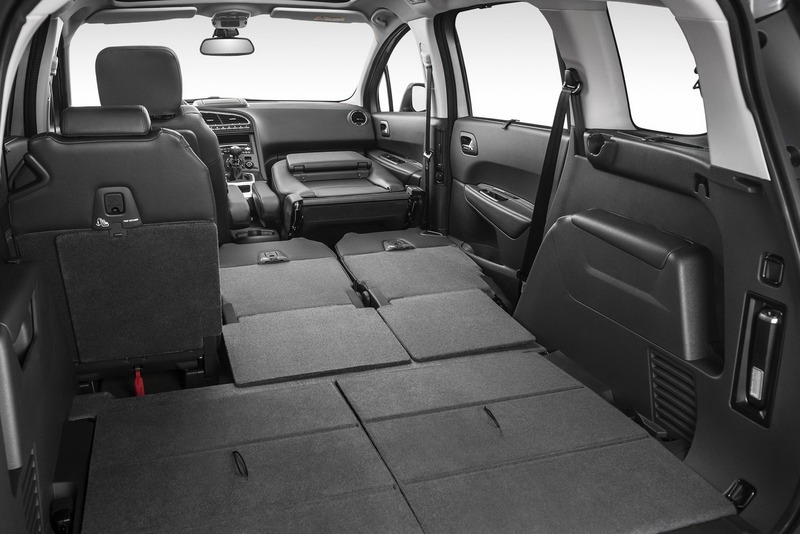 To be successful, an MPV must place its passengers in a high level of comfort but also offer a large loading capacity. 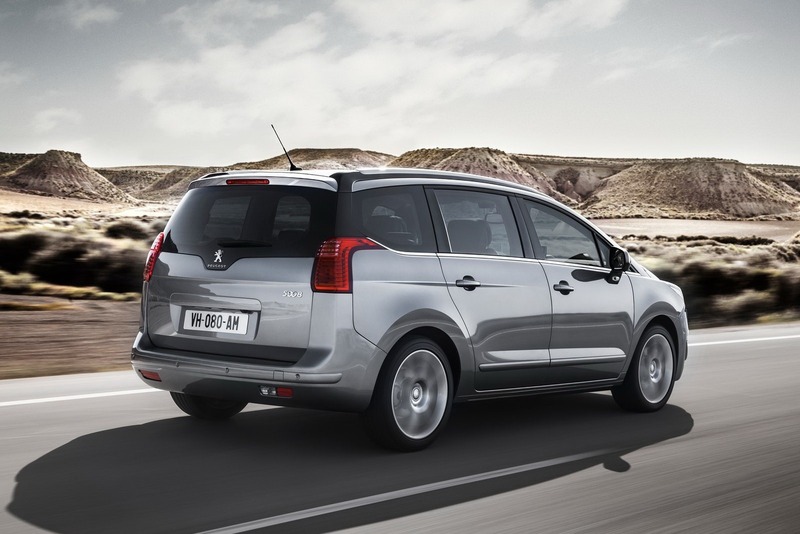 Compact on the outside (4.53m long, 1.84m wide), the Peugeot 5008 rises to this challenge with a large boot capacity which is easy to use. When row 3 is retracted, the space under the shelf varies from 758 to 823-litres (579 to 678 dm3 VDA standard 210) depending on the position of the sliding seats. With row 2 also retracted, the volume is increased to 2506-litres (1754 dm3), a remarkable loading capacity. In this configuration, the surface of the floor is completely flat from the boot sill to the front seats. It is also possible to place the passenger seat in the table position to a loading length of 2.76m. At the wheel of the 5008, the driver is assured of a high level of safety for its occupants and also for those around the vehicle. In town, the large glazed surface area offers excellent peripheral visibility. 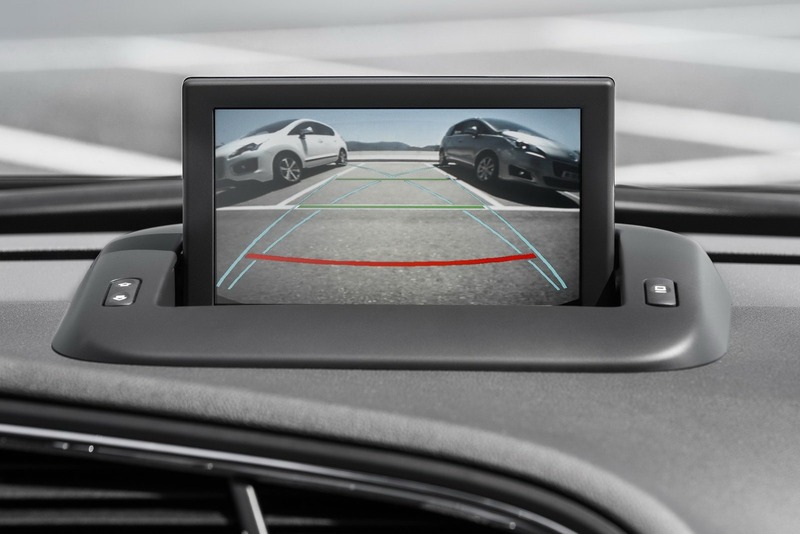 To go a step further, the front and rear parking assistance can be supplemented by a reversing camera. Installed on the tailgate, its image is reproduced on the dashboard screen and indicates the outline of the vehicle in its surroundings using coloured markings. Reversing becomes easier, as does looking for a parking space! The available space measurement system informs the driver when the size of a parking space is suitable. When the vehicle is turned off, the electric handbrake is applied automatically. Monitored by an ECU linked to the ESP, the system remains on standby while the vehicle is immobilised to adjust the braking force regardless of the situation, for example on a slope. On moving off, when the driver presses the accelerator pedal the electric handbrake is released automatically. The ESP also incorporates the Hill Assist function. When moving off on a hill, this assistance function maintains the brakes are applied for two seconds after the driver has released the brake pedal. This time lapse allows them to start the vehicle moving without it rolling back. On the road, the driver controls vehicle speed with the speed limiter/cruise control. Using the 24GHz radar equipped Distance Alert, they are warned if the distance from the vehicle in front, expressed in seconds, falls below a safety threshold defined by the driver. Configurable between 0.9 and 2.5 seconds, the alert appears in red on the retractable polycarbonate strip of the Head-Up display. The Head-Up display shows key information (vehicle speed and, if selected, the speed limiter / cruise control), arranged in the centre of the driver's field of vision with the focus at the bonnet. For immediate reading, each function is now presented in full-colour: white for the current speed, orange for the speed limiter, green for the cruise control and finally red for the Distance Alert. To protect the passengers in the event of a collision, the passenger compartment has six airbags: two front, two side and two curtain. The curtain airbags even cover the last row of seats in the 7 seat version. Operating with a single generator, they are triggered at the same time as the side airbag for optimum responsive safety for of all of the occupants. When driving on snow, the ASR incorporates an additional function. The Snow Motion is an intelligent traction control system, allowing the vehicle to move off and travel effectively on icy or snow covered roads. This management of the ASR is triggered automatically and is even more effective when combined with snow tyres. 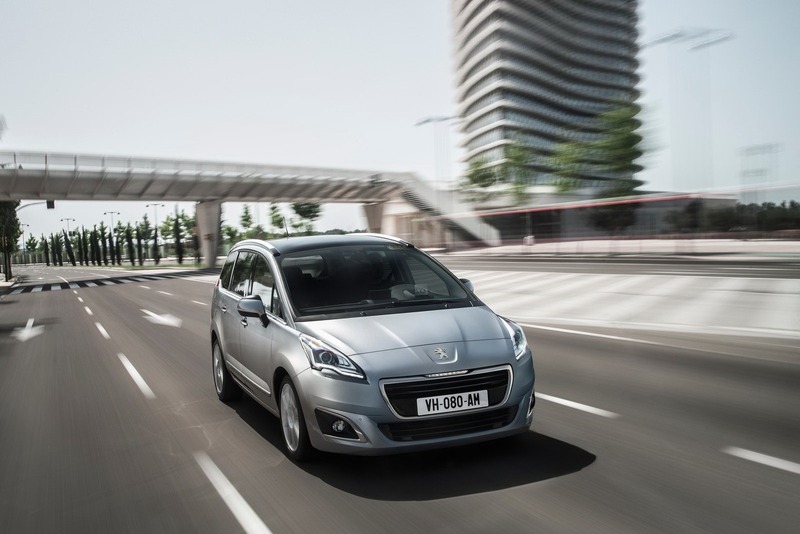 Due to the expertise of the marque's engineers, the handling of the 5008 is worthy of comparison with other Peugeot Hatchback cars. On board, the passengers enjoy an entirely new experience, combining driving and comfort - this combination being one of the main characteristics of the Peugeot 5008. CO2 emissions start from 109g/km, and the range consists of eight engines, of petrol and diesel, with manual, automatic or ETG gearboxes. Mah, troppi elementi tirati all'indietro su sto frontale.. sembra una di quelle donne iper rifatte con i mega zigomi e gli occhi da gatto. Non so, devo capirla meglio, anche se l'assenza delle feritoie sotto i fari e l'aspetto un po' meno dimesso la rendono un po' migliore alla già non brutta pre-fl. Migliora anche questa imho,anche se c'è da dire che anche la pre-facelift non mi dispiaceva. leggero me ben riuscito fl ad una vettura dalle ottime qualità. plancia un po incasinata, forse troppo e volante da migliorare... è quasi uguale a quelle delle vecchie 406! Peugeot, senza troppo clamore, continua a tenere aggiornata la propria gamma. concordo, inoltre c'è anche la qualità. provare (ne ho usate davvero tante) per credere! la linea esterna delle nuove Peugeot può essere discutibile (in particolare per l'eccesso di cromature) ma gli interni, sia come design che come qualità percepita sono veramente notevoli. Ho viaggiato su sta 5008 e la piacevolezza della plancia e dei suoi materiali era davvero encomiabile. Piuttosto , anche se sono OT, ma se sono in profondo rosso (come bilanci) dove piffero li prendono i soldi per nuovi modelli e continui aggiornamenti della gamma? Involgarita e persino banalizzata, con quella calandra insipida e messa li in qualche modo. Prima era l'unica Peugeot con un frontale pulito e gradevole, degno delle Peugeot pre-boccona. Che si son fumati in Peugeot?